One week ends and another begins. It’s been a tough couple of weeks for many, even more so than other weeks. After a bitterly cold and seemingly unending winter, Toronto’s spring has yet to settle in, as it jumps from sweltering daytime highs to overnight lows that wreak havoc on wardrobe choices and spark terror in the hearts of gardeners. Yesterday’s cold rain came and went in great sweeps and gusts, ripped my umbrella inside out, and left me soaked and miserable as I waited for that most elusive of creatures – the dreaded Lawrence Bus. It’s a hard rain, baby. 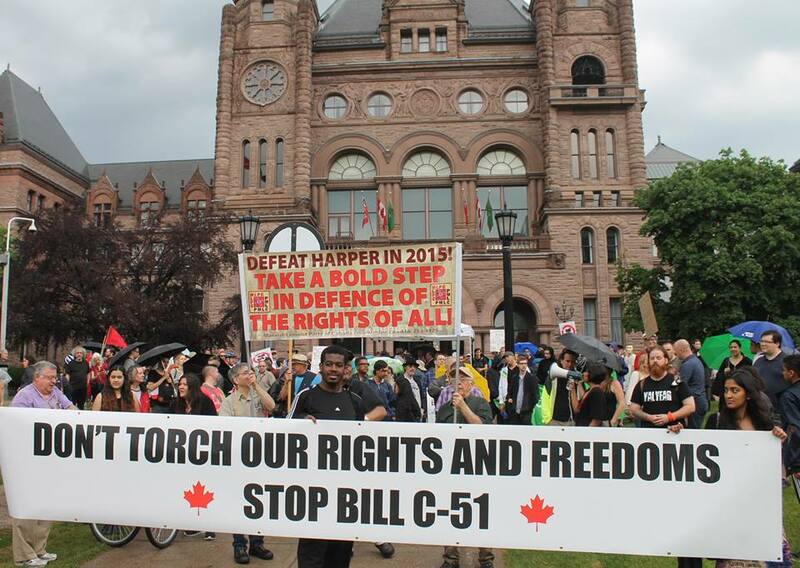 I had intended to join the thousands protesting Bill C-51 at Queen’s Park, but the downpour, a lack of bus fare, and a husband increasingly concerned by possible repercussions due to my outspoken opposition to our government, kept me home. For those who think that opposition to the Bill is melodramatic and all conspiracy theorish, ask yourselves; is your concern that the protesters will be beset by terrorists? Or that the protesters will be stealthily added to a police file, arrested for attending a rally, audited mercilessly, or simply have their characters assassinated, and their passports taken away? Which means that protesting the Pipeline, or even Monsanto, is loosely covered under the bill, as terrorist acts interfering with Canadian economics. “There will, if this law is not blocked, be no checks left on state power. State Security will operate outside the law. 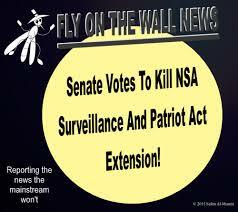 Citizens will be convicted on secret evidence in secret courts. Citizens will be subject to arbitrary searches and arrests. Due process will be eradicated. Internal security organs will serve as judge, jury and executioner. 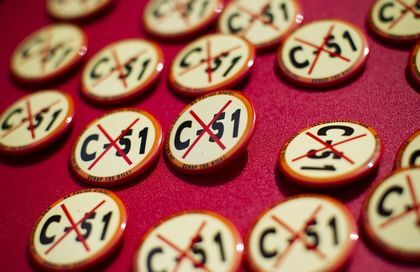 The outward forms of democratic participation — voting, competing political parties, judicial oversight and legislation — will remain, but become meaningless forms of political theater.” Chris Hedges on Bill C-51. The Canadian arm of Amnesty International indicated that the anti-terrorism bill could be used to target environmental activists and aboriginal protesters, or any other form of protest without an official permit or court order. It’s pretty ironic that Canada is set to ramp up security, just as America’s NSA has been told to stop collecting citizens’ private information. And that’s very daunting. 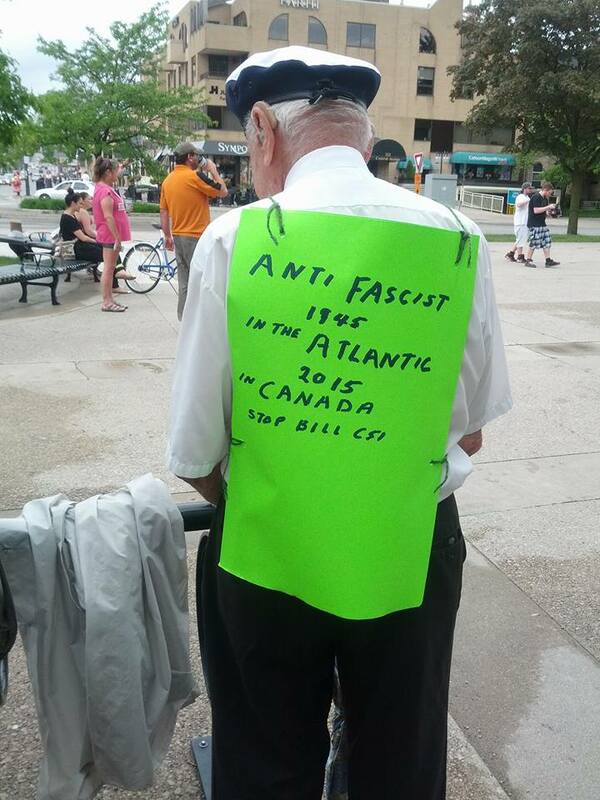 And a real blow to Freedom of Speech and Canadian democracy. But don’t take my word for it … ask the Raging Grannies of Ottawa. They’re game, these Grannies, if a little distracted. And brave. Or ask Cathy Cook, who wrote and performed this blues, empathizing with victims of Stephen Harper’s contempt of aboriginals, women, environmentalists, and veterans. Or the Ontario based singer/songwriter Terry Tufts, who’s written several songs on our messed up government, and lack of choice in the upcoming election. If nothing else, it seems like we’re finally getting new Canadian protest songs. What is concerning, however, is that the new protesters all seem to skew to the higher end of the age spectrum. Like Dennis Jones, a musician and songwriter based in Dartmouth, Nova Scotia, who’s been playing guitar and singing for 48 years. Or Ian Patton, a 5-string banjo player/composer from Edmonton. I find it interesting that the songwriters protesting this Bill are middle-aged and older. People of all ages are attending rallies for this and other protests, so there are certainly younger voices available. I’m not sure if the lack of participation is due to apathy, a dread of the folk music scene, or a lack of information. Maybe it’s a mix of all three. Let’s close out with Stevie and the ConserviCats singing the praises of the new Secret Police Bill C-51. Right then, enough with the politics … How’s about some new music? This moody ballad is from Vintage Trouble’s first album. Their next release, 1 Hopeful Rd., is due to drop August 14th. Currently, the band is opening for AC/DC in Europe. Live, these guys are monsters, as several of us here at DBAWIS can attest. Quirky singer/songwriter David Celia has a record release party set for June 4 at the Great Hall. Here’s a taste of the new CD. Rats! I missed Food Revolution Day, Jamie Oliver’s global campaign to put compulsory practical food education on the school curriculum, on May 15th! And of course, don’t forget that Xprime will be playing their new album at their CD release party at the Rivoli on June 4th. See you there!